This vegan no-churn cinnamon roll ice cream is out of this world delicious. 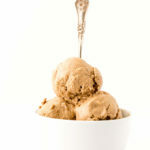 Layers of naturally sweetened, smooth and silky cinnamon ice cream are swirled with ribbons of caramel-like cinnamon sauce. Best part? Thanks to Medjool dates and cashew butter, there’s no need for a fancy ice cream maker or churning to make this sweet treat ultra rich and creamy! This post is sponsored by Natural Delights. All thoughts and opinions are my own. The steamy summer heat has officially taken hold. Wardrobes have shifted from corduroy pants and canvas jackets to jean shorts and colorful cotton tanks. Gardens have welcomed the first of many vibrant blooms and grills have cooked their first round of corn on the cob (or as is the case in our house first several rounds—we are in the Midwest, after all). 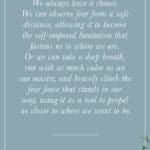 Each year around this time, as the seasons make their official shift from spring to summer, I notice a shift in my cravings as well. 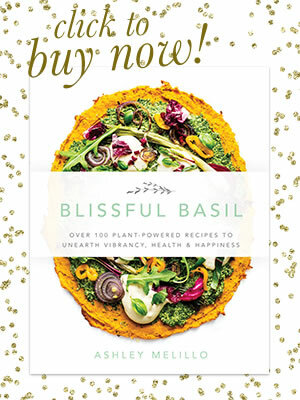 So long are the daydreams of cozy meals, soups and stews. The empty space where they once resided is quickly filled in by an intense, nearly insatiable craving for all things fresh, crisp, juicy, and frosty. Crunchy veggies like cucumbers, bell peppers, and celery overflow from our refrigerator. Sweet fruits like mangoes, cherries, and nectarines fill our counters. And chilled frozen treats like popsicles and cashew ice cream line our freezer drawers. And while I love the fact that grocers are dedicating more and more of their own precious freezer space to dairy-free ice creams, there’s just something special about whipping up a batch of the good stuff right here at home. Also: Why does store-bought vegan ice cream only come in tiny pints? And why is it so expensive? Don’t get me wrong, it’s completely worth it, especially when a fierce ice cream craving strikes. But I can make about triple the amount of homemade ice cream for about half to two-thirds of the price it would cost to buy the same amount at the store. More ice cream + less money = more sweet summer fun. 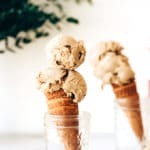 Another perk about homemade vegan ice cream? No goofy gums or funky, hard-to-pronounce additives. Just pure, naturally sweetened, close-to-the-earth ingredients coming together to create something that tastes entirely decadent. This vegan no-churn cinnamon roll ice cream relies on similar ingredients and methods as this recipe and this recipe. The secret to ultra-creamy, churn-free vegan ice cream? Natural Delights Medjool Dates and homemade cashew butter. 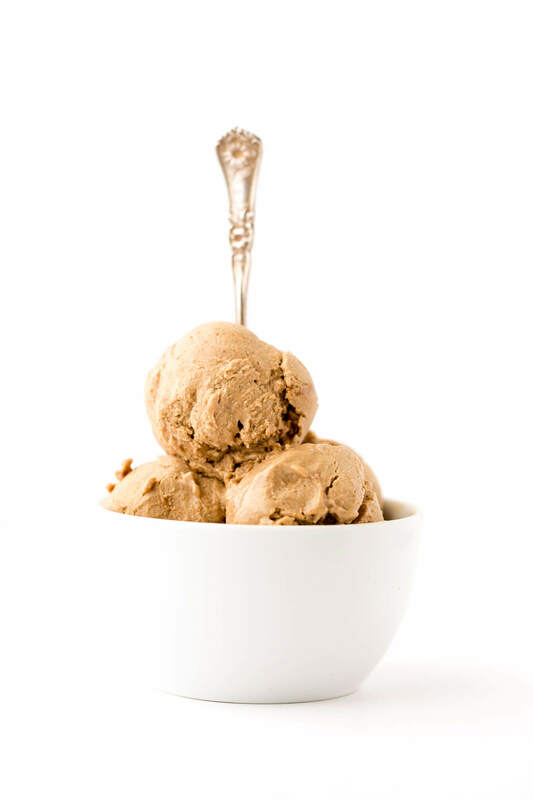 Because neither the dates nor the cashew butter freeze completely, they allow the ice cream to set with a super rich, creamy, and scoop-able texture without the need for a fancy ice cream maker or churning. 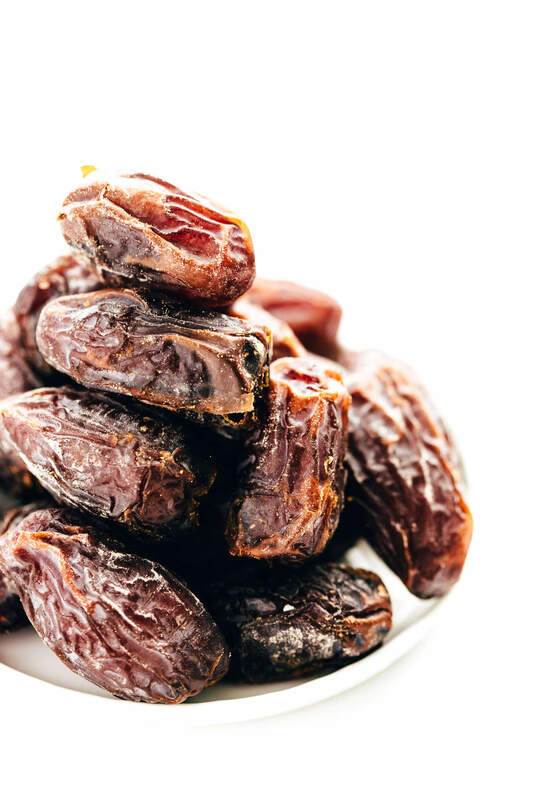 The dates also naturally sweeten the ice cream, so there’s no need for added sugar. A win-win. To make this vegan no-churn cinnamon roll ice cream, you’ll start by rounding up the ingredients for the cinnamon ice cream base. Add everything to a blender and blend on high until super smooth and creamy. While the mixture is blending, you’ll whip up a super quick, caramel-like cinnamon roll swirl sauce. Simply whisk together cashew butter, maple syrup, ground cinnamon, vanilla, and sea salt over low heat until smooth and glossy. Once the swirl sauce is made, you’re ready to start assembling. 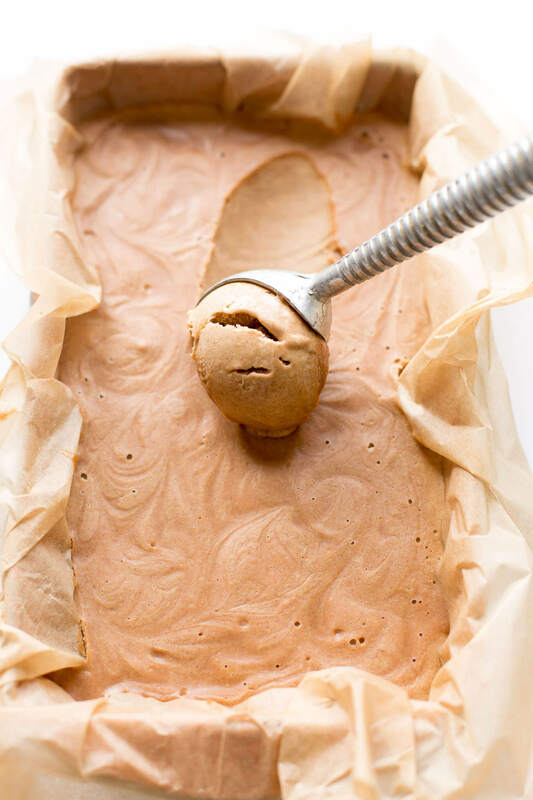 Pour about half of the cinnamon ice cream base into a lined loaf pan. Then, drizzle with about half of the cinnamon roll swirl sauce, and use a toothpick to swirl the sauce into the ice cream base. Repeat. Carefully transfer the pan to the freezer and freeze for at least 8 hours to set the ice cream. 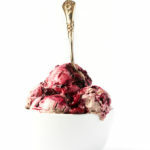 Remove the ice cream from the freezer about 15 minutes before serving to soften slightly, then scoop, scoop, scoop away. This vegan no-churn cinnamon roll ice cream is ultra rich, creamy, and almost custard-like with a flavor that tastes just like a giant cinnamon bun. 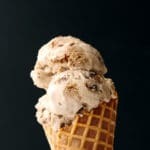 It’s delicious and perfectly dreamy all on its own or scooped into a cone, but I’d imagine you’d have something extraordinary on your hands if you paired it with a bit of vegan caramel and coconut whipped cream. 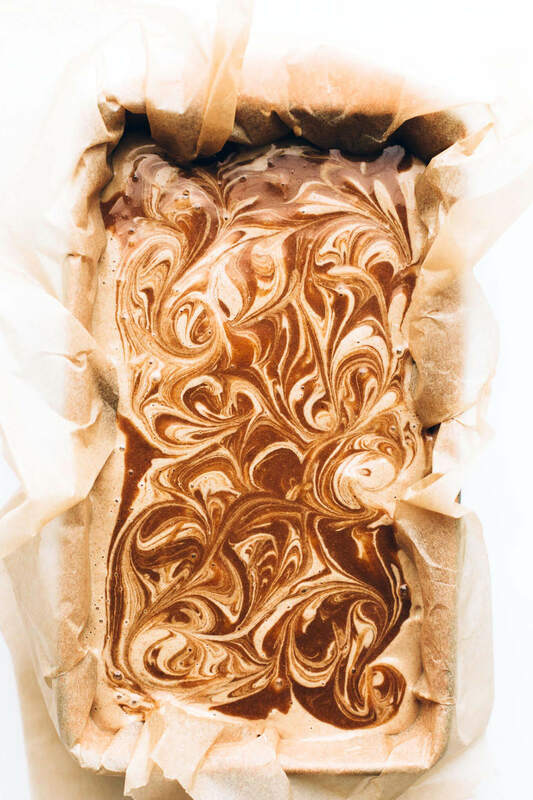 Line a 5"x10" loaf pan with parchment paper. In a high-speed blender, combine the almond milk, dates, cashew butter, almond butter, cinnamon, vanilla, and sea salt. 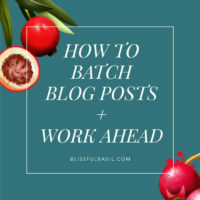 Blend on high for 3 to 4 minutes or until completely smooth. In a small saucepan, whisk together the cashew butter or almond butter, maple syrup, cinnamon, vanilla, and sea salt over low heat for 3 minutes, or until smooth and glossy. Let cool slightly. Pour about half of the cinnamon ice cream base into the lined pan and drizzle with about half of the cinnamon roll swirl sauce. 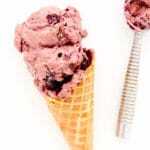 Use the pointy end of a chopstick or a toothpick to gently swirl the sauce into the ice cream base. Top with the remaining ice cream base and drizzle the surface with the remaining swirl sauce. 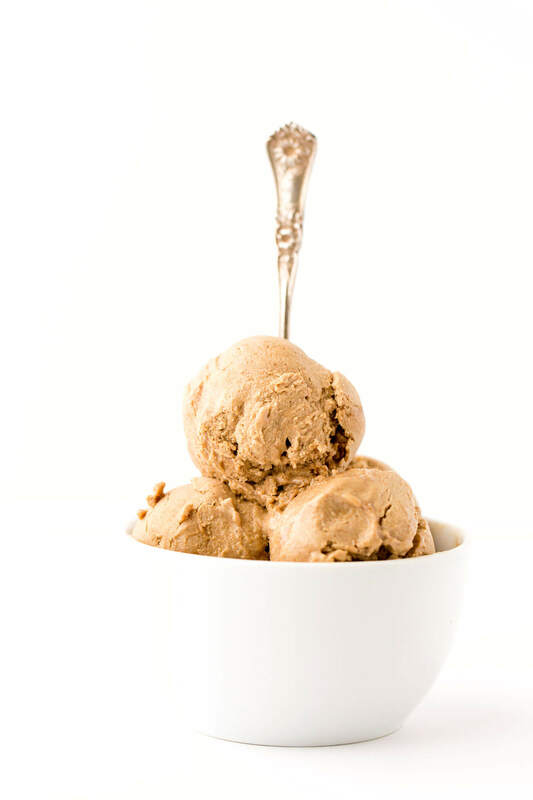 Again, use a toothpick or chopstick to gently swirl the sauce into the ice cream base. Loosely cover with plastic wrap and freeze for at least 8 hours, or until the ice cream has set. 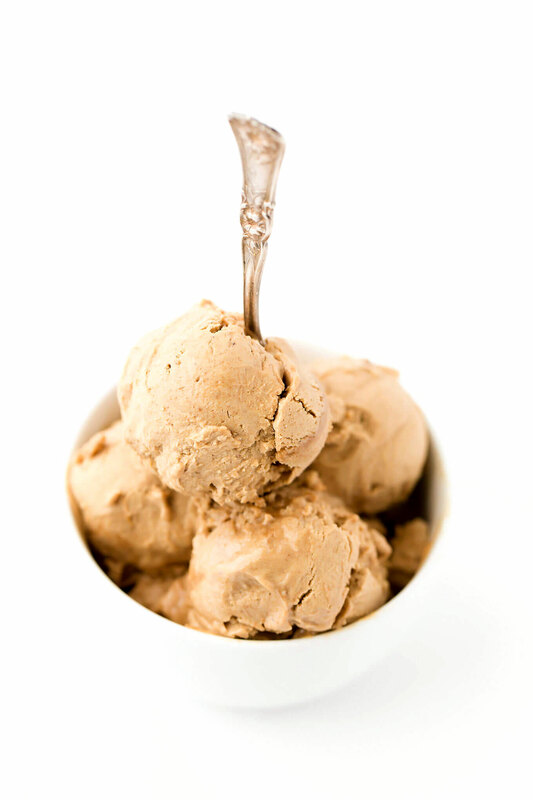 Let the ice cream stand at room temperature for about 15 minutes before scooping or serving. Then, dip a scoop in hot water and use it to scoop the ice cream. Serve. Store the ice cream in the freezer, loosely covered, for up to one week. *Make your own cashew butter by blending 3 cups raw cashews in a food processor for 6 minutes or until smooth (it should be very thick), stopping to scrape down the sides as needed. If the cashew butter is chunky and clumping as it moves around the food processor, add 1 to 3 tablespoons of filtered water to encourage blending and to yield a smooth, creamy cashew butter. Measure off the amount needed for the recipe and store the extra cashew butter the refrigerator in an airtight jar or container. 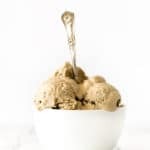 **To simplify, you can omit the almond butter and use a full 1 1/4 cups cashew butter (that said, I very much prefer a hint of almond butter in this ice cream); however, do not omit or substitute the cashew butter—it's very important to the texture of the ice cream. Wow Ashley! 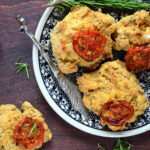 What a wonderful recipe with which to kick off the summer! I can’t wait to give this icecream a try and share it with all of my friends. Very excited about this recipe. I can not wait to make it. Perfect timing! 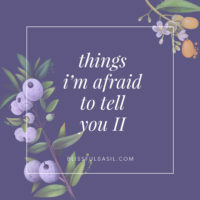 I have been having daily ice cream cravings and making lots of grocery store runs for NadaMoo! Now this will definitely be my go-to summer dessert thanks to the dreamy flavors and nutritious ingredients list. 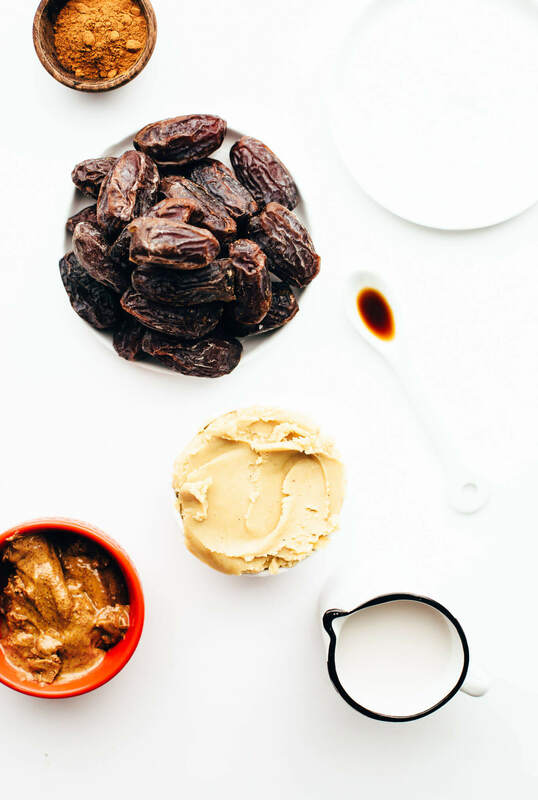 Nut butter and dates are truly magic in so many recipes! I’ve been avoiding making homemade ice cream since they all call for coconut milk/cream–gets boring and nutritionally, I’d rather have nuts. 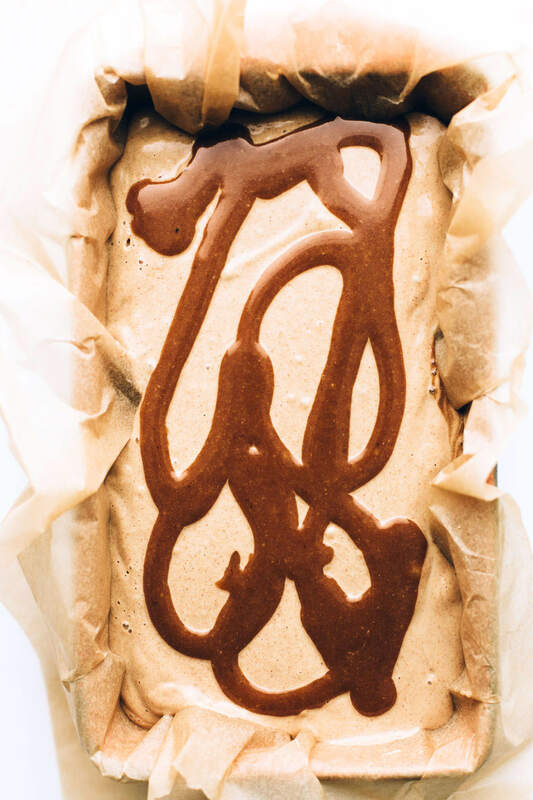 I’m even going to spring for the cashew butter and make this! Plus sometimes I don’t have room in my freezer for the ice cream maker tub. Thanks so much! WOWZERS! Just when I thought cinnamon rolls were already heaven on a plate, you turn them into ice cream! Wonderful taste. 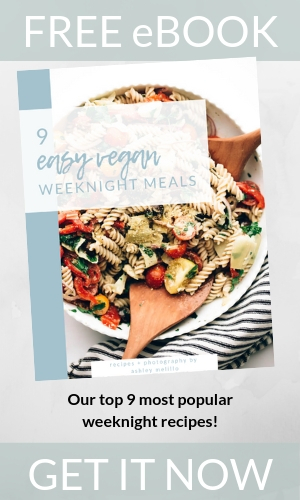 Thanks to you and this recipe, I’ve now tried cashew butter. But I couldn’t get it swirled like you did—way too thick. I’m making this again for Christmas Eve. It is so delicious. Actually so much better than regular ice cream even the best brands. I’m hooked! nut butter not creamy enough ? or more needed as didn’t add swirl PART OF RECIPE l? or is it because almond milk homemade and it separates – ie when u make it and leave in fridge as milk it separates out and you have to shake it up again ? please help as taste was good ! sorry in proper english this time !! !